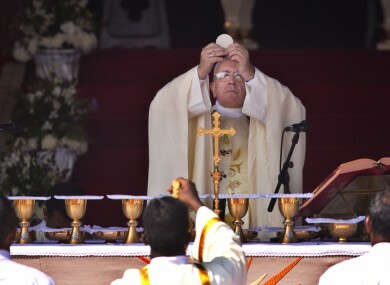 Pope Francis prepares for the Holy Communion. CATHOLIC BISHOPS WRAPPED up a divisive synod on the family by submitting a ‘consensual’ report to Pope Francis that reflects a stalemate in the battle between the church’s conservative and liberal wings. The document, which Francis is free to ignore, fudges the issue of whether divorced and remarried believers should be allowed to play a full role in the Catholic church. It also confirms the pullback from the more explicit opening to lesbian and gay believers supported by progressives when the review of teaching on the family was launched last year. Francis, who recognised in closing remarks that the three-week synod had exposed deep divisions in the Catholic family, will now consider how much of the report he takes on board when and if he decides to update guidelines on Catholic teaching on a broad range of issues linked to family life. The text advocates a “case-by-case” approach to the most controversial question, the handling of divorced and remarried believers, saying they needed to play a greater role in the church but stopping short of explicitly ending the current ban on their receiving communion. The document includes only one brief article on the church’s approach to homosexual believers, framing the question in terms of how priests can help support families who have “persons with homosexual tendencies” in their midst. It reiterates that the church believes every person, regardless of their sexuality, is worthy of respect and a reception which takes care to “avoid every sign of unjust discrimination”. There are absolutely no grounds for considering homosexual unions to be similar or even remotely analogous to God’s plan for marriage and the family. In closing remarks, Francis said the synod had been about confronting “today’s realities” without “burying our heads in the sand”. We have also seen that what seems normal for a bishop on one continent, is considered strange and almost scandalous for a bishop from another; what is considered a violation of a right in one society is an evident and inviolable rule in another; what for some is freedom of conscience is for others simply confusion. He also appeared to take a new swipe at the conservatives who had accused him of rigging the synod’s organisation to try to engineer progressive conclusions. “The different opinions which were freely expressed -– and at times, unfortunately, not in entirely well-meaning ways -– certainly led to a rich and lively dialogue,” he said. Email “Catholic bishops have a new view on allowing divorced people receive communion”. Feedback on “Catholic bishops have a new view on allowing divorced people receive communion”.